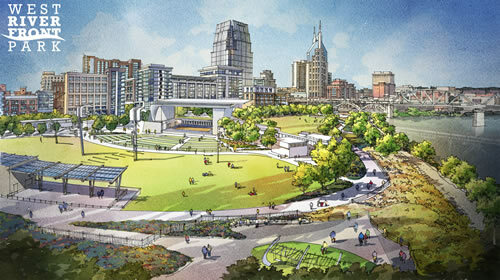 Gibson Landscape is proud to play an important role in the construction of Nashville’s West Riverfront Park – a new outdoor venue in the heart of Downtown. West Riverfront Park will encompass 18 acres and include an amphitheater , dog park, ornamental gardens, a lawn dubbed “The Green” and bike-and-pedestrian-friendly paths and greenways. We are currently in the final stages of the construction and can’t wait to see the final product when the park opens to the public this summer. To learn more about our role in the project, view our work.